When we say outdated, we mean there's a rule that states London Hackney Carriages have to carry a bale of hay and sack of oats to feed the horse... yes, it’s no wonder motorists get a little confused! So, to put your mind at rest, we spoke to the motoring solicitors and legal experts at Rothera Sharp’s transport team to clear up some of the most common driving law misconceptions. 1. 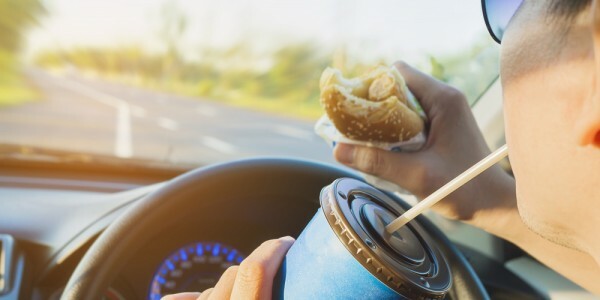 Is it illegal to eat while driving? While this is not strictly illegal, if it affects your standard of driving and the police catch you, you could be prosecuted. In a study by Leeds University, drivers were found to have 44% slower reaction times when eating behind the wheel. 2. As a driver, can I drink behind the wheel? And are passengers allowed to drink alcohol? Drinking is legal behind the wheel (this obviously just applies to soft drinks), and on particularly long journeys keeping hydrated can help you stay more alert. If you have passengers in the car who are 18 or older they can legally drink alcohol; rules regarding alcohol only apply to drivers or if you are supervising a learner driver. 3. Can I have the interior light on when driving? Probably one of the most common ones people believe to be illegal, but there’s actually no law against having the interior car light on. However, if police think it’s impacting your driving they can ask you to turn it off. 4. Can I wear headphones and drive? 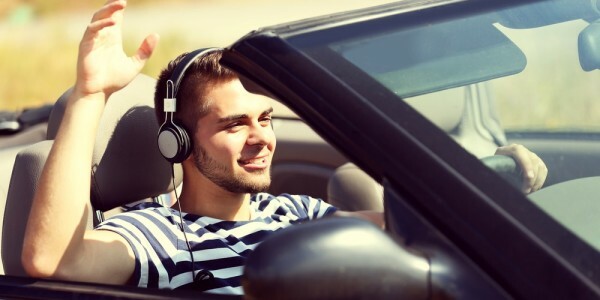 A number of road safety campaign groups discourage the use of headphones while driving but there are no laws prohibiting their use. Blocking out sounds could mean you’re unaware of other things happening around you, such as emergency vehicle sirens, so it’s not recommended you keep the headphones on while you’re behind the wheel. 5. Am I allowed to use my satnav while driving? You are legally allowed to use a satnav, but it has to be in a fixed position, such as attached to your windscreen or dashboard. To act in accordance with the Highway Code, you must ensure windscreens and windows are kept clean and free from obstructions to vision. Again, if the police feel using a satnav has impaired your concentration on the road, you can be charged with an offence. 6. Am I allowed to drive barefoot/wearing flip-flops? It’s not illegal to drive barefoot or in flip-flops; however, with flip-flops there’s a risk the pedals could get caught between your foot and shoe. The Driving Standards Agency does not recommend driving barefoot, stating that “you don’t have the same braking force with bare feet as you do with shoes on”. Suggestions for suitable footwear include shoes that have enough grip to prevent your foot slipping off the pedal, soles that are no thicker than 10mm, shoes that are not too heavy and shoes that are narrow enough to avoid accidentally pressing down on two pedals at once. 7. Do red and yellow lines mean the same thing? Contrary to what many people think, red lines do not mean the same thing as yellow lines. Single red lines mean you can’t stop at any time during the times shown on the sign, and double red lines mean you cannot stop unless you are a licenced taxi or blue badge holder, in which case you can only drop off, not park up. Single yellow lines mean you can park as long as there are no restrictions, or if you are a blue badge holder you can park for up to three hours. On double yellow lines you can stop and drop off but not park; again blue badge holders can park on double yellow lines for up to three hours. Wonder what laws our international driving friends face? Take a look at our feature on the strange world of driving laws.